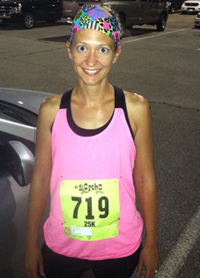 Coach Sara Johnson is an RRCA-certified coach who has been running for more than 10 years. Sara provides personal coaching to runners of all abilities and Kids Running Programs through her business, Reality Running. She has completed 9 marathons, qualified for Boston, and in 2011 finished her first ultramarathon, the Comrades Marathon in South Africa. She has placed in numerous local races, including finishing 2nd overall woman in the 7K at the 2014 Dallas 7K/4K on July 4 and finishing 4th overall woman in the 25K at the 2014 El Scorcho in Fort Worth. Sara is a mother of two and has a master’s degree in Marriage and Family Therapy. She uses her training and experience to figure out what makes her runners “tick” and finds the best way to encourage and motivate them. Sara currently is accepting new coaching clients. For more information on Sara’s coaching services, visit www.realityrunning.com or email her at realityrunning@gmail.com. Feel free to email Sara with questions or comments about this training program. This plan is written for a runner who is new to the half marathon distance but who regularly runs (or run/walks) three miles at least 2-3 times a week. If you have completed a 10K or regularly run five to six miles, run the higher distances suggested. If you are using this plan as a couch-to-half marathon, I would suggest changing the Monday and Tuesday runs during the first month of the program to 30 min run/walks and work on increasing the distance you can complete in that time. As always, please visit your doctor before starting any exercise program. During half marathon training, building endurance is top priority. Don’t worry about speed, but focus on finishing each run feeling strong. Don’t hesitate to use walking breaks during your half marathon training program if needed. If you want to take regular walk breaks during your long runs, or any run, try using set intervals from the beginning of the run. Start by alternating 2 minutes of running with 1 minute walking. Gradually increase the time spent running until you are running the entire distance or you reach a running/walking ratio that is most comfortable for you. The Fairview Half Marathon course features more hills than the usual north Texas half marathon. To better prepare you for race day, I suggest finding a hilly course for your Monday runs or using a treadmill to help simulate running hills. Listen to your body. Feeling sore after a long or hard run is expected. However soreness or pain in a specific spot (knee, ankle, hamstring, etc) could be a sign of oncoming injury and a day or two of extra rest may be needed. Remember, it is much better to miss a day or two of training than it is to push through pain and develop an injury that keeps you from running on race day. Including some basic strength training into your routine will help strengthen your running muscles and may help prevent injuries. Simple leg exercises such as lunges and squats and core exercises like the plank performed 2-3 times a week work well. Don’t forget to stretch, too! You accept this training plan at your own risk. You understand that any fitness plan should not be undertaken without the guidance and supervision of your doctor. These plans are provided as a tool for general guidance. The Active Joe, Fairview Half Marathon, and the coaches providing these training plans are not responsible for any injuries arising from this generalized training plan.